The Belgian national men's field hockey team represents Belgium in international men's field hockey and is controlled by the Royal Belgian Hockey Association, the governing body for field hockey in Belgium. Belgium won the Hockey World Cup in 2018, and won a silver and a bronze medal at the 2016 Rio de Janeiro and 1920 Antwerp Summer Olympics respectively. They also reached seven semi-finals at the European Championship since 1995, including a third place in 2007 and runners-up in 2013 and 2017. Hockey was introduced in Belgium in 1902. The country's first club was founded in 1904. In 1907, several clubs established the Belgian Hockey Association. Belgium played its first international match against Germany, and was one of the founding members of the International Hockey Federation (FIH). Between 1920 and 1978, Belgium appeared in two of the first three World Cups and in eleven out of thirteen Summer Olympics. After the successful early years (before the 1950s) with three times being among the best five at the Summer Olympics, it would last six decades before Belgium reached the international field hockey top again from the 1990s on. By the early 2000s, the Royal Belgian Hockey Association started to invest heavily in the youth and modernised its structures. In 2007, Belgium won the bronze medal at the European Championship, a first in the country's history. Belgium also qualified for the 2008 Summer Olympics, for the first time in 32 years. 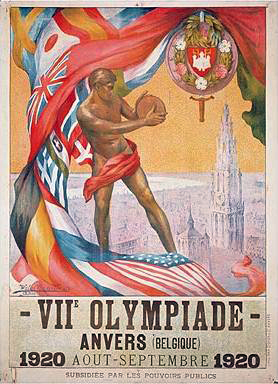 Belgium won a silver medal at the 2016 Summer Olympics, a second medal after Belgium ended third at the 1920 Summer Olympics in Antwerp. Two years later Belgium won the 2018 Hockey World Cup. It was the first major international title in the country's history. A red box around the year indicates tournaments played within Belgium. In 1920, Belgium's field hockey team won the bronze medal at home, at the Olympic Stadium in Antwerp. The following 18 players were named on 3 April 2019 for the 2019 Pro League match against Spain on 10 April 2019. Caps updated as of 10 April 2019, after the match against Spain. ^ "Red Lions & Red Panthers: selectie wedstrijden Pro League in Ukkel". www.hockey.be (in Dutch). 3 April 2019. Retrieved 4 April 2019. This page was last edited on 12 April 2019, at 15:55 (UTC).